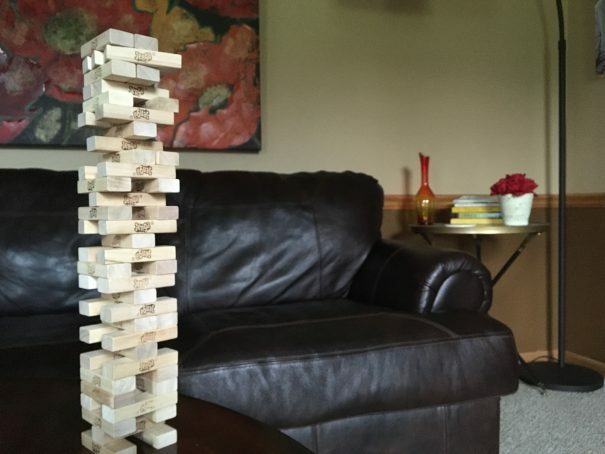 I’m playing Jenga because that’s what my nephews always want to play when I’m around. But then we move on to Xbox because kids get bored quickly so we have to change from one thing to another. So why when we grow up do we have to play the same game over and over again for the rest of our lives? I mean, as soon as you discover what you’re good at you have to do that for your career. You might know how this feels because 70% of people hate their job and The 4-Hour Workweek spent more than four years on The New York Times bestseller list. Most people tell themselves, “Well, that’s just the way life is.” I know, because that’s what I used to say until I discovered financial independence. And I’m going to tell you everything you need to know about how to become financially independent in just one sentence. Are you ready? There. I’ve written over 100,000 words about becoming financially independent that can be distilled down into those nine words. And if you live your life by those nine words you’ll eventually become financially independent — maybe even retire early if you want to — but more importantly you can go play something else. Now, you might be thinking it’s easy for me to say spend less, because after talking with thousands of my readers they all tell me it’s hard. Why? Spending less means giving things up, and we hate giving things up. I was in Brooklyn recently and met this girl who started telling me about her money problems. How she was forced to cut everything to the bone. That’s what the endowment effect is. Behavioral economists use this term to describe how we place more value on what we have than on what we don’t have. Like in one study people were given a coffee mug and when they were offered the chance to sell it or trade it for something of equal value they wanted double what they were willing to pay for the mug. We hate giving things up. “If you are willing to change your circumstances it is quite possible to quit. I did that this year, left a job I had been at for 13 years and was unfulfilled by, although we have 2 young children, the mortgage, a dog etc, all the regular attachments. We downsized our house by half, weeded out many possessions, and moved to a city 15 minutes away with more job options where we could live with one vehicle. Now I am self-employed and taking a course on the side to expand my options, we are 3 years away from mortgage free instead of 15 years, I see my kids much more and everyone is happier, none of us were negatively affected by cutting less important things out of our lives. Most people hate reading stuff like this. Why? Because we want to believe everything in life is easy and just happens magically. It took years of hard work and discipline to spend less than I earned before I realized you can’t cut your spending to nothing and that you need to earn more. And earning more took years of hard work and discipline, too. Of course, you’re investing all this money because no one gets rich from a savings account. Yet, people still write me saying they’re going to “get rich quick” by trading binary options or investing in cryptocurrency or whatever. Sometimes I’ll follow up with them a year later to see how it’s going (they never respond). And that’s why I always appreciate the people who are honest about their success, because if I want what they have then I know the steps I need to take to get there. Anyways, this was going to be about my first year of early retirement and I just realized I didn’t tell you anything about it. So real quick, it’s changed my life. Sure, sometimes you sleep in until 11 a.m. on a Tuesday knowing your money is working for you. But what I’m learning is it’s really about having control of your time. What he’s saying is if you’re not doing what you want to be doing with your time you’re wasting it, because you can’t get any more of it. When you become financially independent you get your time back because now you control it, and that’s what financial independence is really about.